Does the word "feedback" make you cringe? How about "configuration management"? Steve Berczuk has a pain-free plan for using your build environments and software configuration management system to provide the feedback that is essential to a successful agile project. Humans don't handle complexity well, and we certainly can't see the future—which helps explain why our plans and designs so often are flawed. In response to this truth, our guest technical editor offers Payson’s Law of Imperfect Plans. Embracing this law can help you avoid the dreaded analysis paralysis and accept that perfection just isn't possible. These days outsourcing is a pretty familiar concept in this industry. Has globalization hit your company yet? Naomi Mitsumori has been involved in sending testing work offshore, and she has six suggestions that can help you successfully manage the transition. Pssst. You with the QA hat on. 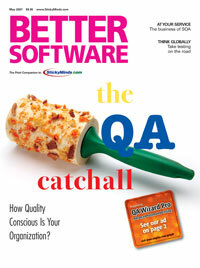 Would you be surprised to learn that you probably don't work in a QA department? Find out why what you are doing may not be QA, and discover some practices you can implement to insure that A really does stand for assurance in your organization. When your boss constantly has you doing favors for another group, it can get in the way of fulfilling your own responsibilities. Find out how defining your work mission to your manager and illustrating how "small" favors potentially cut into company revenue can help to get everyone on the same page. One often overlooked testing skill is understanding what our clients are saying--in addition to the words that actually come out of their mouths. Sometimes reframing a seemingly irrational response can lead to a higher level of communication and a more productive relationship.